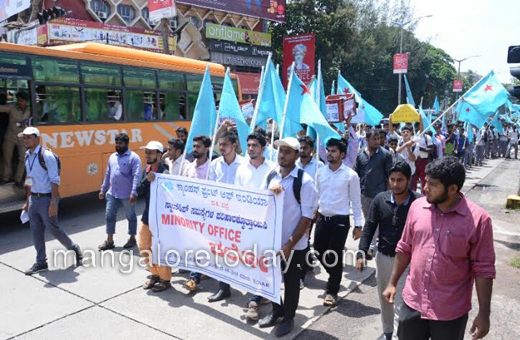 Mangaluru, Aug 26, 2015: The Dakshina Kannada CFI - Campus Front of India August 25 held a mammoth protest at Mangaluru City Corporation where the minority welfare office is situated, demanding solutions to problems regarding scholarships for students from minority communities. 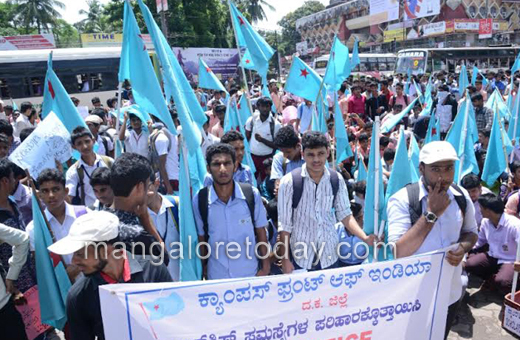 More than 200 students participated in the protest. CFI members rallied in front of the commercial building of the MCC sat down on the spot and began demanding their various needs. 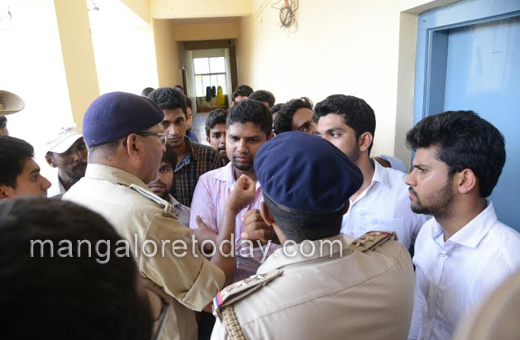 While the protest was going on, some of the CFI members entered the building and barged into the minority welfare office expressing their anger. They then put all the staff out and locked the main door. ACP Tilak Chandra, Urwa inspector Ravish Naik and other police officers tried to calm down the protesters. 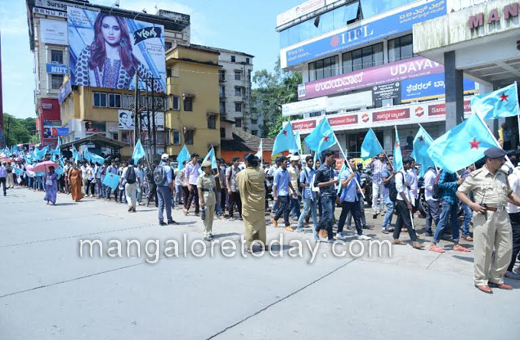 ACP Tilak Chandra told the protesters to open the office door and protest peacefully, and pointed out that that the CFI had asked permission from the police department only to hold the protest and not for blockade. Director of minority welfare department Akram Pasha is busy with personal matters, is neglectng all other matters. 70% of the students are from villages and they do not know how to operate the computer. Earlier pre-metric student scholarships from 1 to 10 standards were provided through schools. 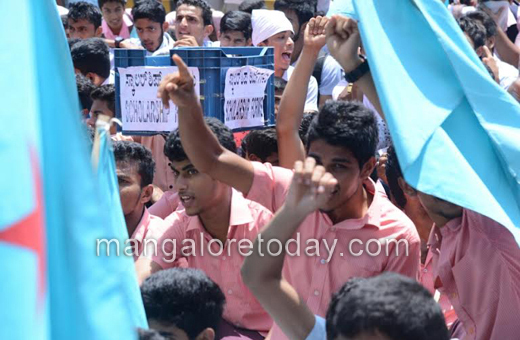 But from this year 9th and 10th standard students are supposed to apply online. The last date for the submission of forms is August 31, 2015. Only a few days are left. Last year 1 crore applications were submitted, but this year the number is only 4.5 lacs. We want the deadline to be extended," he added. 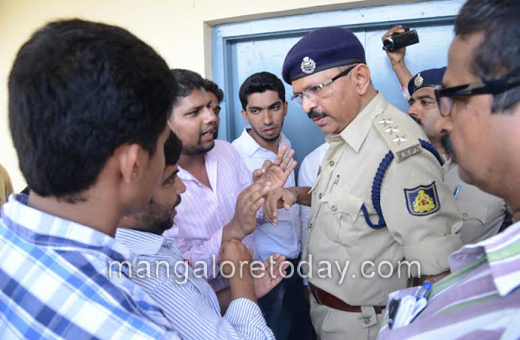 In reply, ACP Tilak Chandra assured that MLA J R Lobo, who has been appointed chairman of the state legislative backward class and minorities committee, will meet the protesters and asked them to vacate the premises. 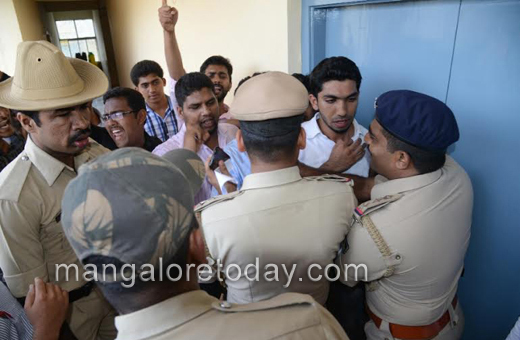 The protesters agreed and opened the door of the minority welfare office. 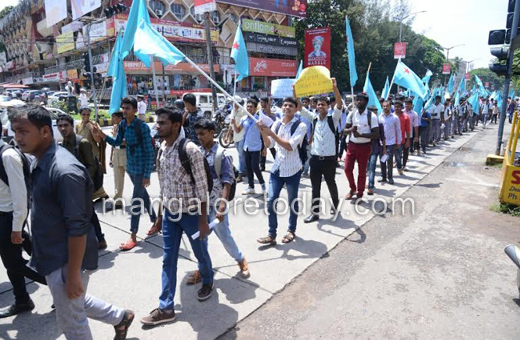 MLA J R Lobo who came to know about the protest, met the protesters and accepted a memorandum submitted by the CFI members who requested him to help them. 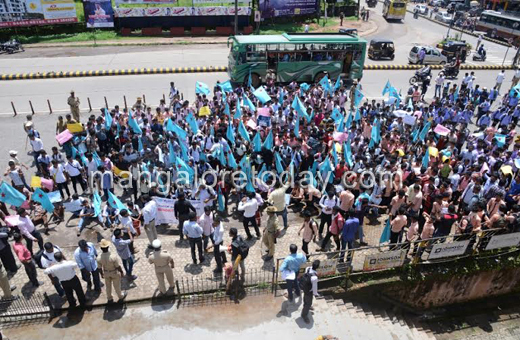 The protest was preceded by a rally from PVS junction to MCC offices. The students below poverty line has to be given scholarships and not on the basis of castes.